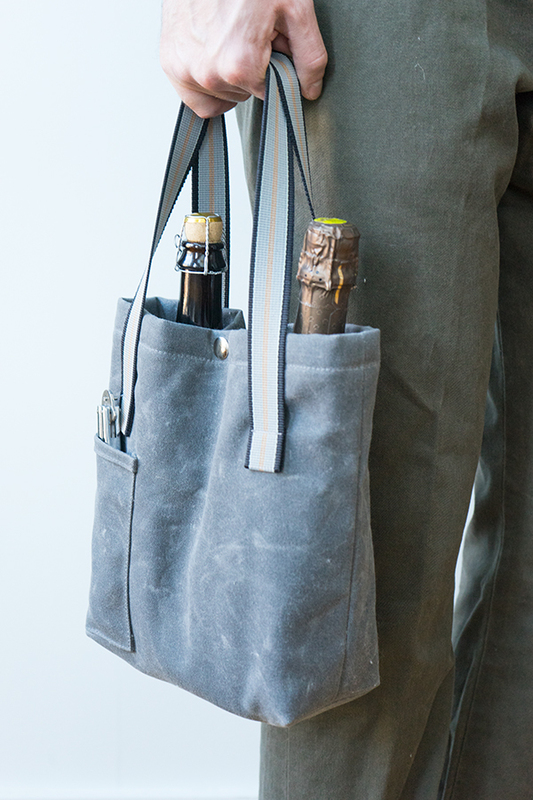 Here is a little preview of my latest project for The Sewing Party, a waxed canvas wine tote. You know all those holiday parties this time of year? Well, now you have the perfect host/hostess gift. Head over to The Sewing Party for a free downloadable pattern and a full set of instructions to make your own! 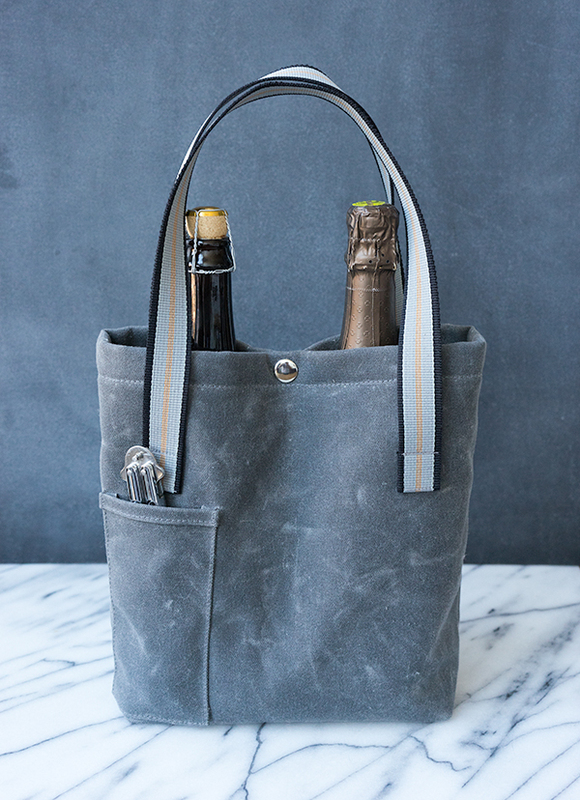 Fill it with wine, beer, or your beverage of choice and celebrate! I’m really happy with the way it turned out. This was my first time working with waxed canvas and I love the stuff. The inside is lined with a soft table felt to protect glass bottles. A small pocket on the outside is big enough for a compact bottle opener. I can’t wait to use waxed canvas for other bags. Over time the fabric will change as new creases and scratches add character to the exterior. Happy holidays everyone! Did you by chance buy your waxed canvas online? I’m looking for something just like that to make a new bag and it is hard to find! Hi Mariah! I am also using waxed canvas for my next bag. I bought this piece on Etsy (https://www.etsy.com/shop/bagsupplycompany), which is okay for a yard or two. If you need a lot, you might want to contact Fairfield Textile who can sell larger quantities. Look for Martexin Original Wax. They have a cutting fee for small orders, and shipping is usually pretty expensive because it ships on a long roll. Hope that helps! Bag making is very interesting. I saw your other bags. That’s what I do the most of, though I make clothes like a recycled denim vest recently. Have you worked with stretch fabrics yet? Pullover shirts are a breeze with a nice cotton stretch; slap on a patch pocket and I like to put an Mp3 pocket just above the waist ad off to the side where comfortable. Pingback: Handmade Holidays Nov. 17: Gifts for the Dapper Genteleman | Sew Mama Sew | Outstanding sewing, quilting, and needlework tutorials since 2005. This is a fabulous pattern. I found you on the Sew Mama Sew site. I ordered my waxed canvas at Red Rabbit Mercantile .https://www.redrabbitmercantile.com. I used leather handles – Red Rabbit was happy to put a hardware kit together for me and it arrived quickly. I love the results! Thank you! Glad you like the pattern. Found you on www.madalynne.com. This is a fantastic bag. I’ve just recently started working with thicker fabrics like these. Going to need to research this. I love the weathered look it has. So beautiful.